For last evenings starter, I made a salmon ceviche. 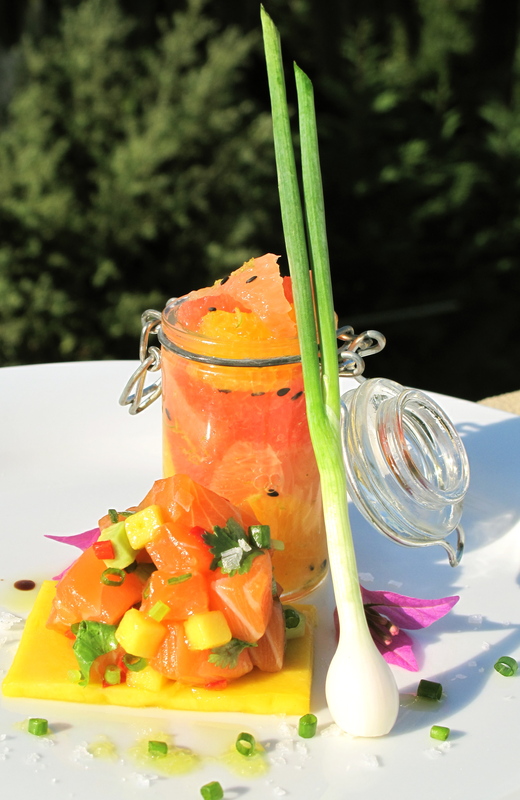 It’s a quick and very tasty dish which is perfect for hot summer evenings on the Côte d’Azur! You just chop some fresh salmon into small dices and squeeze quite a lot of lime juice and let it rest in the fridge for about 20 minutes. I really love spicy food so I always add a hint of fresh chili and drizzle just a little bit of sesame oil. To balance up the chili, I add some fresh mango and avocado. To finish it off, chop some fresh coriander and add some sea salt. I serve my ceviche with a citrus salad which is just pink grapefruit, orange, lime zest and black sesame seeds. I can highly recommend to have it with a nice bottle of ice-cold Pouilly Fumé!